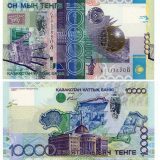 Issued on November 1, 2004. 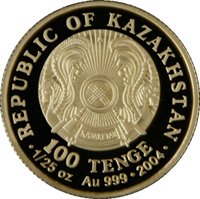 Averse: the image of state emblem of the Republic of Kazakhstan; the face value of the coin “100 TENGE”; the inscription “REPUBLIC OF KAZAKHSTAN”; “1/25 oz Au 999” means metal, quality and weight; “2004” means the year of coinage. 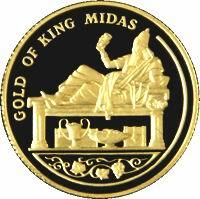 Reverse: the image of reclined on the bed king Midas with a glass and viands near him; the vegetative ornamental pattern; the inscription “GOLD OF KING MIDAS”. 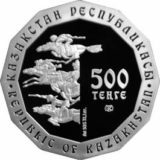 Images and inscriptions on the obverse and reverse sides are relief. 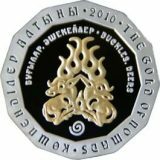 The coin is made from 999 standard gold, the weight is 1.24 gr. 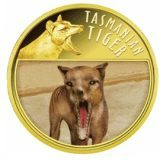 Diameter is 13.92 mm, production quality is “proof”.